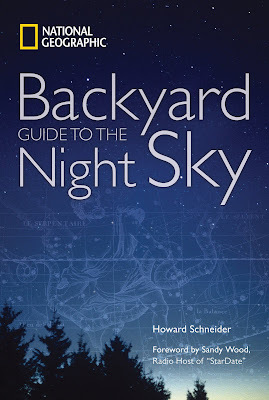 This summer I received a copy of a new astronomy book to review: National Geographic's Backyard Guide to the Night Sky by Howard Schneider (ISBN 978-1-4262-0281-0, trade paper version, list price US $21.95 / Can $26.00). My copy had a substantial heft and feel as well as a quality glossy cover. It is everything I would expect from National Geographic. It's well organized with margin notes that include useful URLs, side bars and boxes with sky facts and lore. The compact size and binding don't facilitate using the seasonal sky charts in the field. I'd be concerned about the binding not really being intended to fold flat. On the plus side, the portability makes it far more likely to be used than sit on a shelf. The subject matter covered goes well beyond the role of a beginner stargazing book. The bool provides mythological, scientific, and historical back stories. It also touches on the relationship between the science of astronomy and the nonsense of astrology. 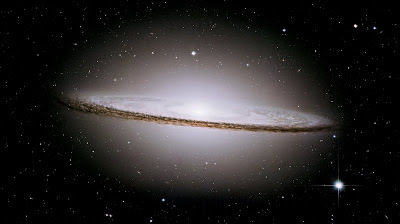 A number of advanced topics like star formation are also introdced. The information for the beginning stargazer is solid. The well structured content provides multiple views and perspectives on virtually every page. The main text is organized into Chapters and Features which I've listed below. The book really isn't intended to be read cover to cover as the structure is more suited for reference purposes. However, there are a couple of places where the reader should look at the material in order such as the introduction and first chapter on Sky Watching Basics. One of the most fun things to do with beginners on a hike is to find a dry field (or take ground cover) and lay out looking up while your eyes adapt to the dark! The text is well written with excellent photos and graphics. A couple of the artist impressions, like the view of Saturn and it's rings from Pluto, are fanciful but this kind of artistic license is not unexpected or uncommon. 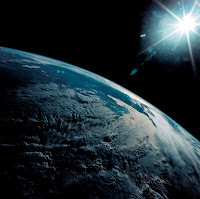 The feature on space junk, satellites, and IFOs is welcome in a introductory guide as they are often overlooked. Also the advice on telescopes is solid. The skies of the southern hemisphere are underrepresented. 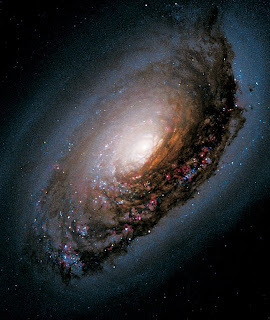 Southern skies contain some magnificent wonders including two of the closest galaxies. The feature helps but I would definitely want more if I lived there or was planning a trip. A few more diagrams in some places would help. I recall reading that globular clusters were located toward the center of our galaxy. I took a momentary double check as I'm used to thinking of them being in the galactic halo (surrounding the central bulge of our galaxy). Both statements are true. The sections on star lore are entertaining and useful but can be confusing; especially those involving the relationships and relatives of Poseidon that give the back story to several of the northern constellations. That's not the writers fault but rather stems from the fact that the family trees of the classical Greek Gods far more resemble hedgerows of Gordian Knots than anything tree-like. The science facts are well researched with few errors. My errata follows. I noticed a typo in the distance to the Whirlpool galaxy (M51). Galaxies are almost always millions of light years distant. This led me to find and correct a contradiction in the Wikipedia article on M51. The back story on the discovery of planets at one point mentions that the orbit and location of Uranus was predicted. Elsewhere the book correctly points out that this was Neptune. The distance to Betelgeuse used in the book was current until 2008 when new measurements revised the distance and size of this red super giant upward by almost 50%. 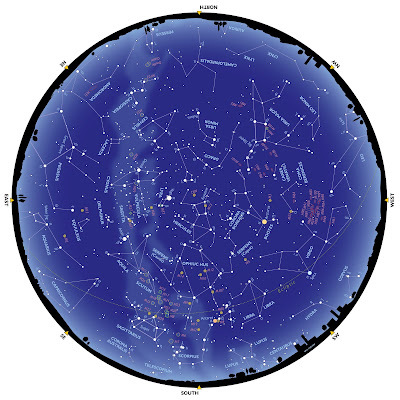 The sections on constellations are well conceived but suffered from small annoyances. The largest was that some of the more interesting stars/objects, such as Stephan's Quintet, discussed in the section weren't always on the constellation charts. A smaller annoyance was switching between the use of Greek letter names and symbols in the text and charts. A beginner may know alpha (α), and beta (β), but will certainly have troubles much beyond that. I do hope that National Geographic publishes errata and has another editorial pass before any second edition. And while I'm at it, a fold flat edition or an accompanying set of fold flat charts would be a bonus. 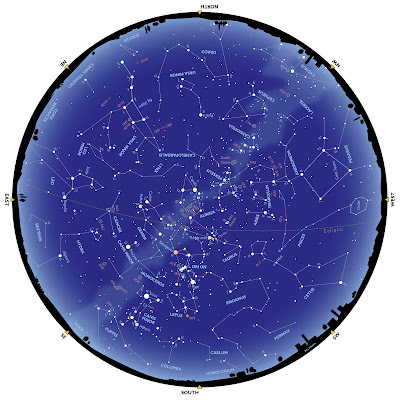 The Backyard Guide to the Night Sky is an excellent addition or starter for the library of anyone interested in astronomy or stargazing. While there are books that do a better job focusing just on stargazing, the Backyard Guide to the Night Sky goes beyond the basics of stargazing and provides a wealth of information to foster the interest of any budding astronomer. In practical terms, the book is an excellent general reference for stargazers and those interested in astronomy. And while a second more accurate set of charts (or a goto telescope) will eventually be needed to find some of the more interesting objects described, the beginner won't need these immediately. In addition to the firm cover version, the book is also available in hardcover and deluxe versions. Try any of National Geographic, Chapters Indigo, or Amazon. All images in this article provided by National Geographic and used with permission. Images may not be used without the written permission of National Geographic and subject to specific restrictions. Posted by Mang (433rd) at 9:50 p.m.